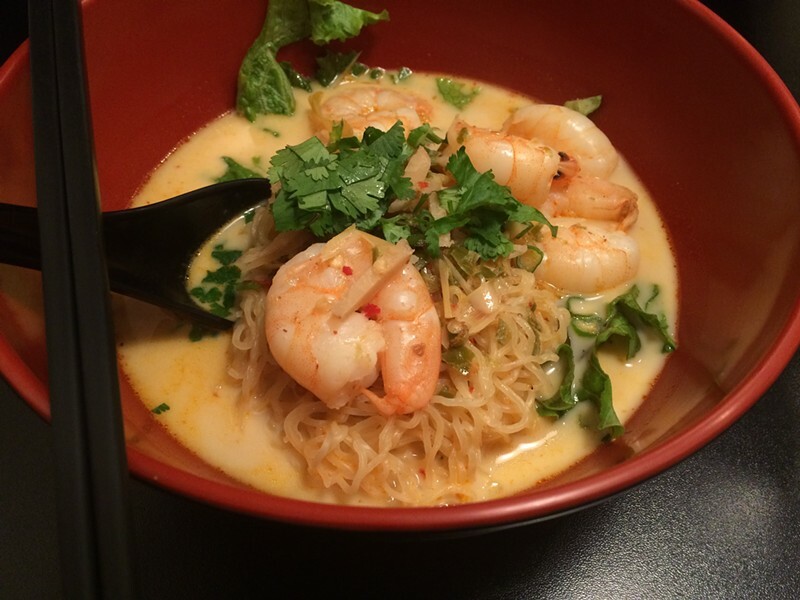 What to order at Chicago's new and notable regional Thai restaurants—translated menus included! 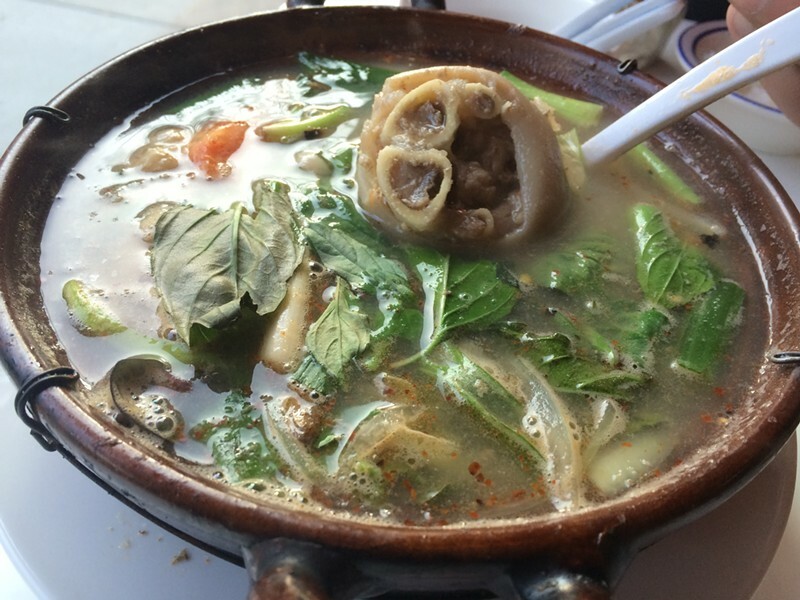 Ah the heady, dreamy days of midsummer 2015, when Arun Sampanthavivat was readying Taste of Thai Town in a repurposed Albany Park police station, and all were dreaming of a Thai Eataly, a one-stop repository for the universe of Thai flavors. Alas, ToTT, turned out to be nothing special. Just a large restaurant with an unsurprising menu, mostly full of the familiar standards you can find on practically every block of the city. 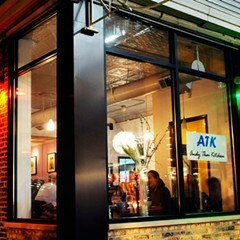 Thai food fans slouched back to the comfort of Rainbow, Aroy, and Andy's Thai Kitchen, secure in the knowledge that they were getting the tastiest, most uncompromising, regional Thai food east of Los Angeles. But were we? This week I reviewed Immm Rice & Beyond, a new Uptown spot from a Spoon Thai veteran featuring khao rad gang, or rice and curry dishes, spooned out from behind a steam table. It's a pretty significant opening, and one that rightfully deserves the attention it's getting. But as I mention in the review, it's just the tip of the iceberg when it comes to relatively new and interesting Thai food around town. 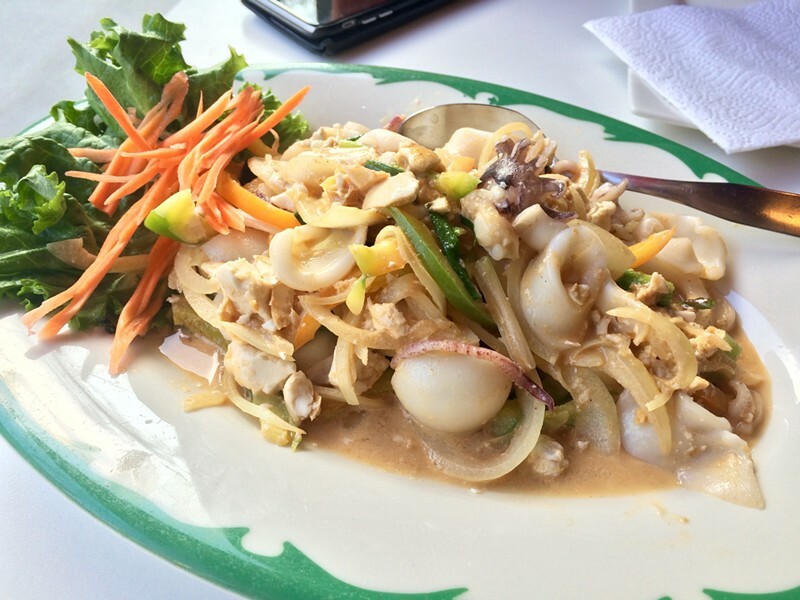 Remember when the so-called "secret menus" at places such as Spoon and TAC Quick were first translated, revealing a whole new world of bright, sweet, spicy, funky food that previously you just couldn't get unless you spoke Thai, or knew someone in the know? You're probably pretty jaded by now aren't you? Well, if that's true I encourage you to check out Tom Yum Cafe, Crepe Town, and Paula's Thai Kitchen. 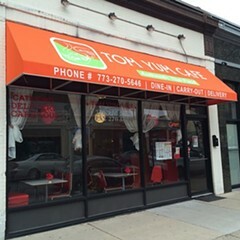 Back when it was a weekly magazine, Time Out Chicago published a story about the late-night scene on weekends at Dharma Garden, when restaurant workers would end their shifts and gather at the Irving Park restaurant to sing karaoke and chow down on sai krok isan, nua dad deaw, and sup naw mai. That's what's going on at these three places, each of which has separate, usually late-night menus with things you don't commonly find on conventional Ameri-Thai menus. 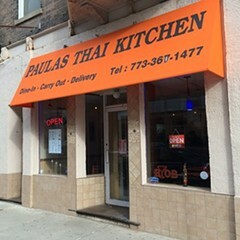 Paula's late-night menu has an English translation. 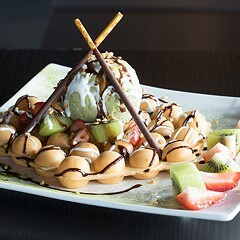 Tom Yum Cafe and Crepe Town do not, but friend of the Food Chain Leela Punyaratabandhu of SheSimmers was good enough to translate them. I've posted them below. I'm probably most excited about this tiny place I learned about from Instagrammer strangefoodschicago (follow him). 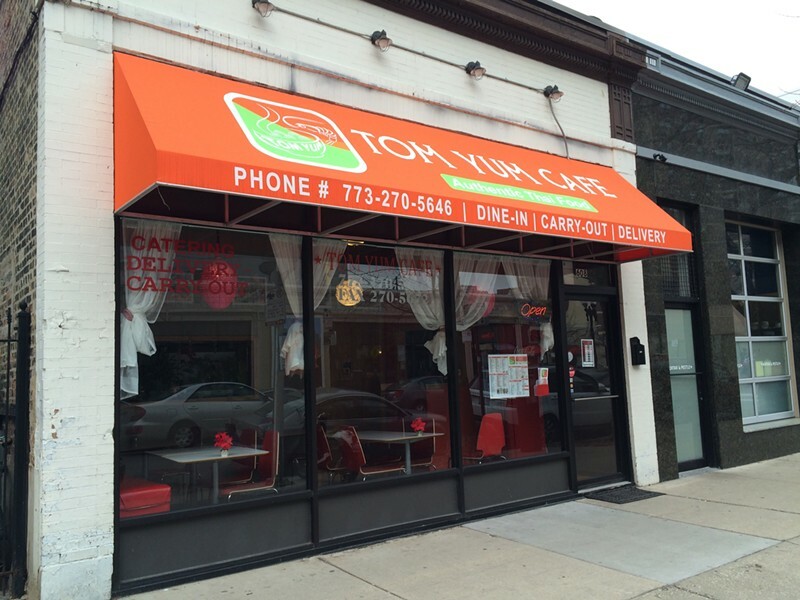 I'm sure I'd have never given it a second glance otherwise—it's tucked off Broadway in Lakeview, with a total of four tables and a take-out menu that wouldn't make an Amish farmer blink. 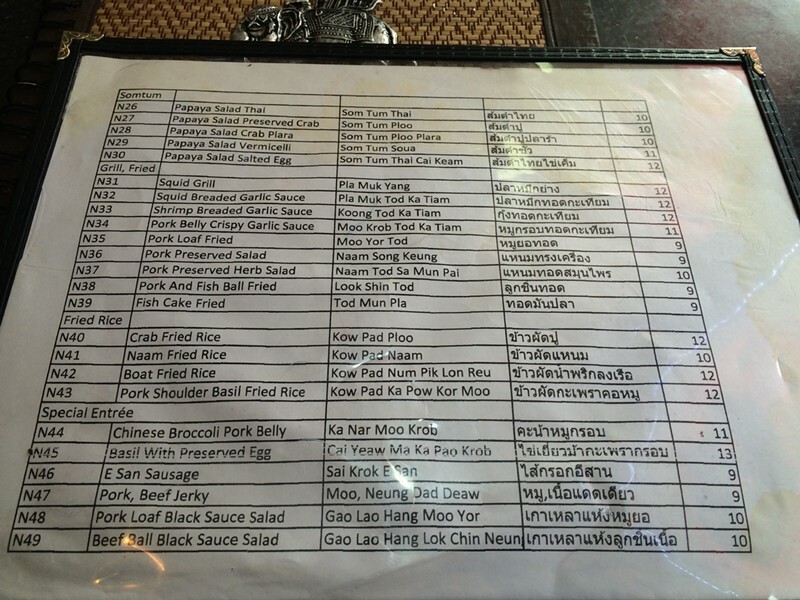 But hidden in plain sight on a dry-erase board on the wall is a second, more or less permanent menu that acts as an addendum to the laminated one written entirely in Thai. 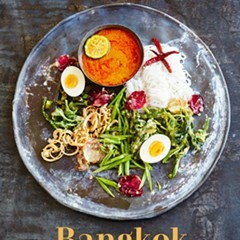 They contain such uncommon treasures as pla som thot, or panfried soured fish (the dish that got Punyaratabandhu excited); som tam that, a large, shareable som tam platter with things like pork rinds, hard-cooked eggs, rice vermicelli, and fresh vegetables, with herbs on the side; and kaeng som cha-om khai, or sour curry of acacia leaves. 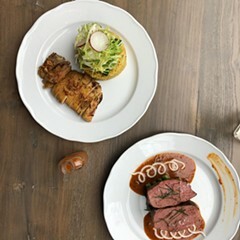 These menus are available more or less all day, though the dishes they contain aren't always prepped in the early hours, so they might take a bit longer to arrive. Portions are huge, but don't let that stop you. Pla som thot here is extraordinary. 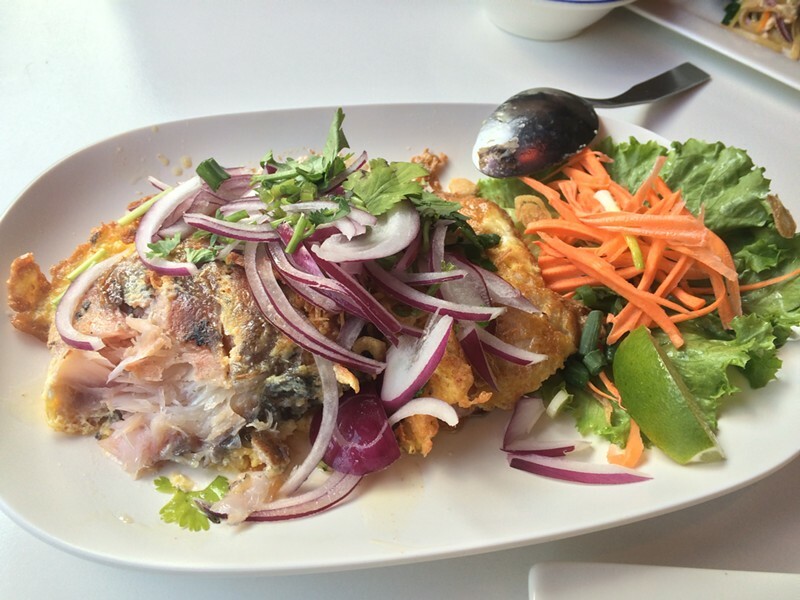 The fish arrives hidden under a pile of herbs and red onions and perched on a thin, crispy omelet, and it takes some work to extract the pink flesh from the skeletal structure; its intense sourness comes from fermenting in cooked rice, garlic, and salt. Funky as a Bootsy riff, but in no way could you consider it spoiled. It has a similar profile to the fermented pork sausage naem, the star of the crispy rice salad naem khao thot (also on the menu), so much so that I wonder why no one makes a version of that dish with pla som. 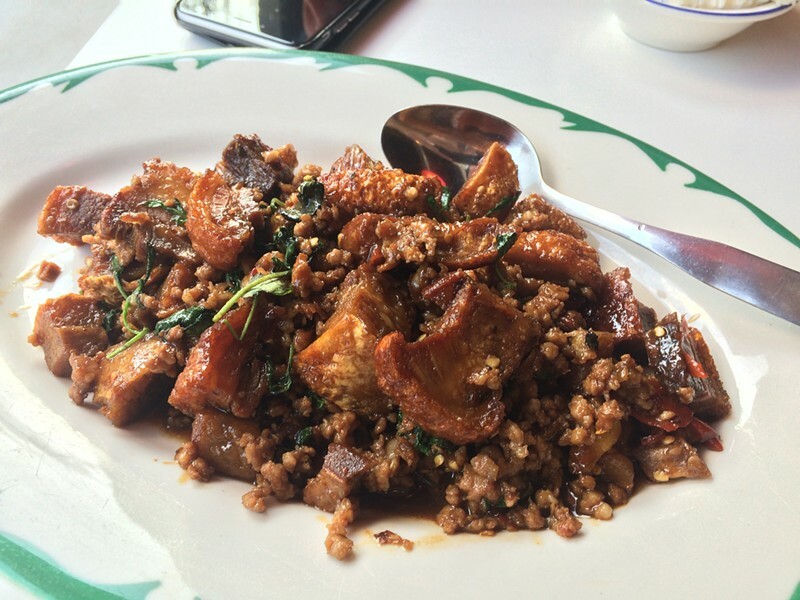 There's also an unusual version of phat ka-phrao mu krop, a sweet and umamic stir-fry of deep-fried crispy pork belly and fragrant basil, this version incorporating ground pork; tom saep kraduk mu, the northeastern Isan region's answer to the central territory's tom yam, a deep tureen of murky, tart soup supposedly with pork ribs (mine came instead with gelatinous pig's feet—not complaining). Meanwhile pla muek phat khai khem, or stir-fried squid with salted duck eggs, brings some bottom-end funk to the proceedings. Line 20: Thank you for your support . 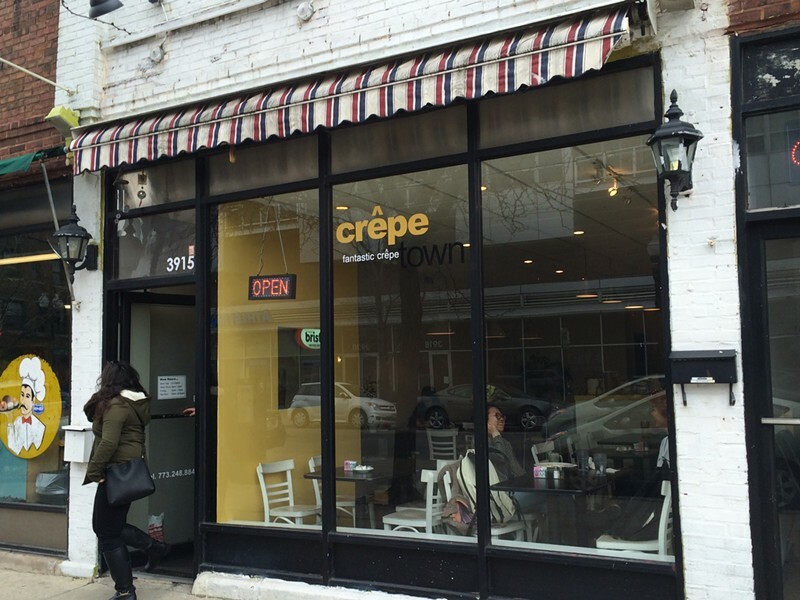 . .
One evening when Tom Yum was unexpectedly closed, Strangefoodschicago redirected us to this little Wrigleyville storefront trafficking mostly in crepes with a huge variety of fillings. Can't say I recommend them. There's a also a bunch of snacky things (fried mushrooms, onion rings, chicken wings) and salads, and a pasta menu on which you'll find spaghetti a la tom yum, described as "a twist on your favorite thai soup!" Sounds sketchy? 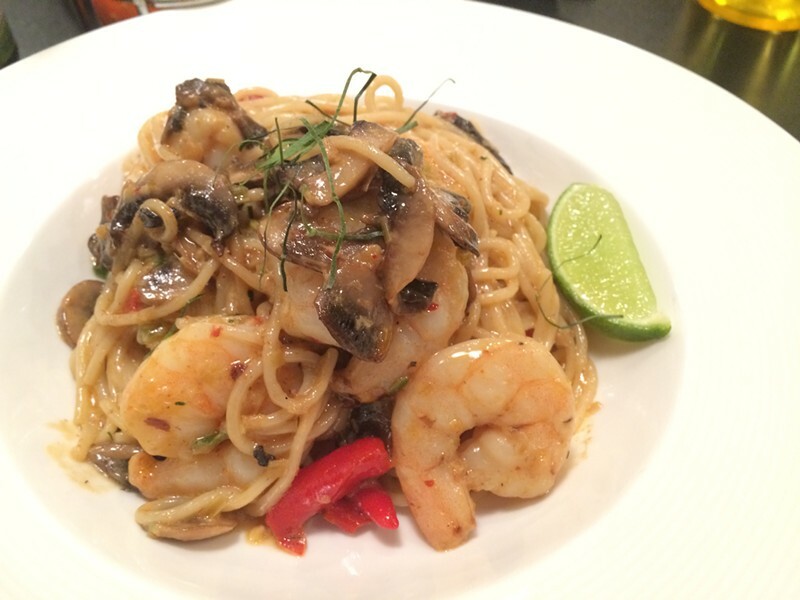 It's delicious, with a tart, creamy sauce, sauteed mushrooms, and sweet bouncy shrimp. 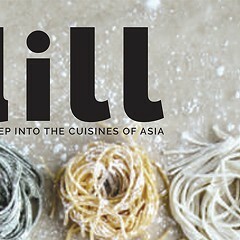 There's also a 14-item Thai-only menu served only after 10 PM, featuring Thai noodles, salads, and crepes stuffed with pork floss and the irresistible chile jam nam phrik phao. Being early birds, we were unable to access most of this menu except for the noodle soup with soy-braised chicken drumsticks, which was too sweet to finish, and a creamy-style tom yam noodle soup with more of those pristine shrimp, which was delicious. 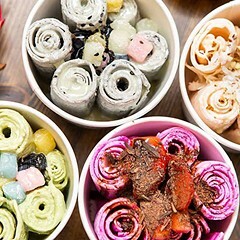 This little Lincoln Park spot is the newest among the trio, but its kitchen is home to a veteran chef, Duong Ta (daughter of Paula), who's cooked in Thai restaurants all over the city, including Spoon and Dharma Garden. 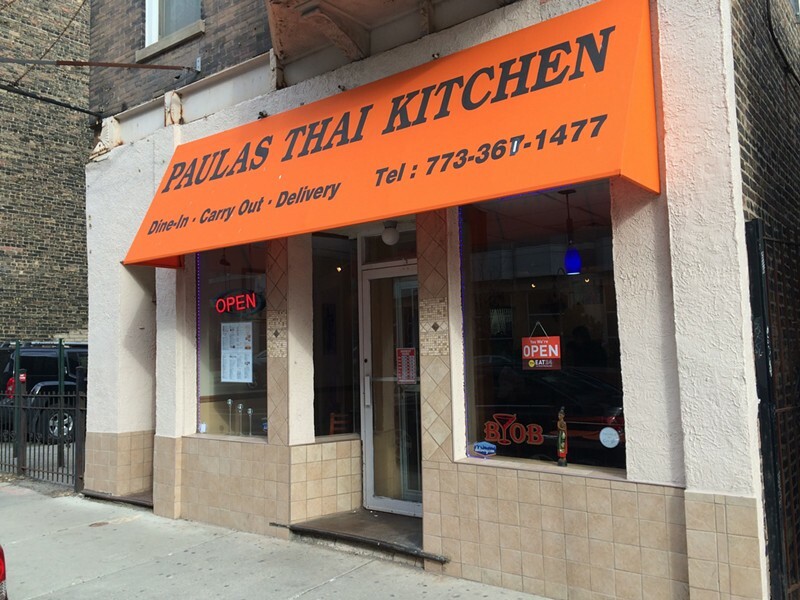 Like Tom Yum Cafe, it features a conventional Thai menu—but the good stuff is on a two-page, fully translated menu, served only after 4 PM, when Duong arrives for work (Paula's is open until 2 AM). Among the three, it has the greatest variety, and if you're a fan of the O.G. 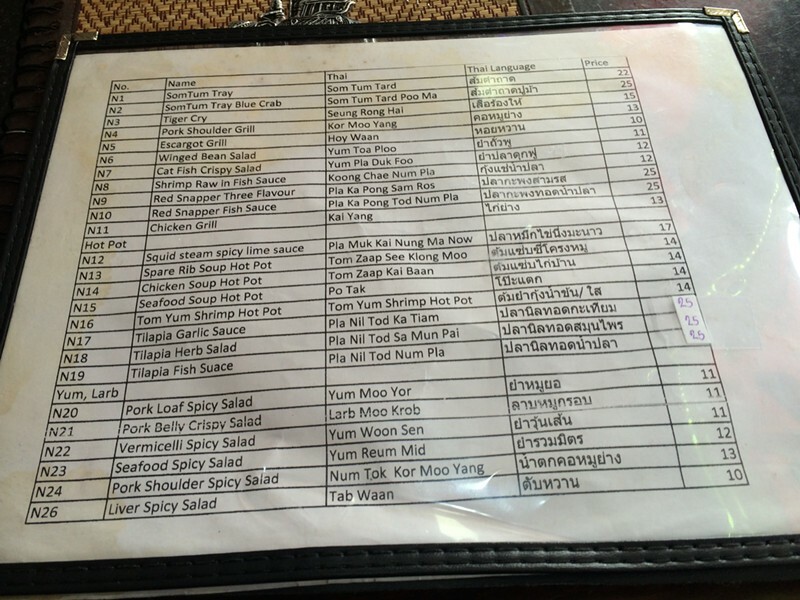 secret menus, you'll recognize a lot of dishes. New to me was naem tod sa mun pai, or pork-preserved herb salad, full of crispy fried shallots, peanuts, and Chinese sausage. It's an ideal drinking food. Then there's the unusual gao lao jang chiin neun* (Punyaratabandhu suspects this dish is properly spelled kao lao luk chin nuea), a salad of springy beef meatballs with Chinese broccoli in a sweet soy-based sauce.